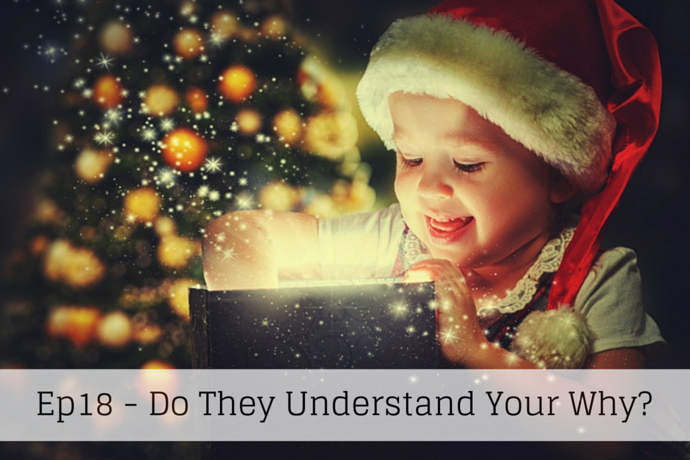 Do they understand your ‘Why’? I bet you’re thinking, ‘What on Earth is he talking about?’ Anyway, Episode 18, ‘Marketing for Owners: the Podcast’. Hey, Jon here! Do they understand your ‘Why’? Let me explain myself. Quite often you ask people to do things or you expect people to do things for you. However, when you’ve explained how or why you want it doing, are you getting, what I call, ‘buy-in’? Buy-in could be from management above you. It could be from anyone. It could be from customers. Unless you’ve explained the real root reason, the ‘Why’, then you’re not going to get the full benefit of what your people can do for you. So I’ll explain through a story, a few years ago when I first started on the Emyth Mastery Program, I flew across to San Francisco for a weekend retreat. Trust me eleven hours for two days, flew back, a bit tiring – ugh! And of course I fly to San Francisco, the first I’ve been there, and it’s freezing cold. What is that all about? It’s California! It hadn’t been that cold for years. Just my luck! Anyway back the story. We talked about this trucking company and the guy was trying to get to the bottom of a problem. His trucks, whenever they came back at the end of the day, were filthy, absolutely filthy. He could not get his trucking staff, his drivers, to keep them clean. He didn’t understand because these guys were driving the same truck every single day. And he thought they would take good care – like you’d possibly take the care with your own car or something else that was your own. And he would’ve done it if he was driving one of the trucks, and he’d have kept it clean from the start. But he could not understand how, every time he asked why they’re messy it just wouldn’t make a difference. So he looked into it came up with a solution. His solution was a checklist, so, at the end of the day the truckers got this checklist and its check, check, check boxes. Is it clean? Is it this? Is it that? Whatever! And that did not work. It just didn’t work, didn’t really make any difference. Of course for the first few days it was okay, but then not so good. So he sat down with his truckers and he explained. And of course these are big burly guys (this is actually a true story by the way.) He explained to his big burly guys that he got sort of slightly upset about this, and frustrated. Somebody asked him, “What was the big deal?” And he then explained that he had an entire strategy for the company. He had a vision, he had a “strategic objective”, as Emyth calls it, and he had it written down. He wanted the company to grow to be in a certain position in its local market and he wanted the customers to think of it as clean in a notoriously dirty trade. He wanted to stand out and he wanted to have cleanliness as one of the things. Because once that would happen they would get more customers, there will be more profits. He wanted to then install a profit share for the staff and there’s a whole system and a forward program of about five years and a whole plan but he couldn’t get it started. Once he started talking about that, the drivers started asking about this strategic objective. What was it? What did it mean? Why? And so he went and dug it out and read it to them. Now for anyone who’s taken the Emyth course, you’re supposed to involve your staff and he hadn’t and many people are doing the same. As he hadn’t explained they just thought, “Oh, he’s fussing. What an old woman. He just wants clean things. Does he want us to use dusters and clean it every day?” But once he explained his “why” then, at last, he got the buy-in. Are you explaining the ‘why’? Think it back to the root cause, all the way back. And apply this to any situation you can. It’s a Wednesday and today is Friendly Follow Day. It’s for a gentleman named Dave Kerpen. Dave wrote the book Likeable Social Media and he has a business called Likeable Media built on it. So you’re getting it from the horse’s mouth. This is to see what he does? How he works Twitter? How he works Social Media? How he works it well? How he builds a following and how the people listen and look out for what he’s got to say? How he gets added to lists? How he does it for his company? How he gives great information? How he forms his tweets? How he sometimes recycles them in a nice way? 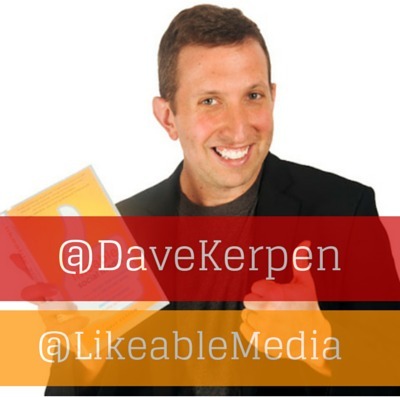 Please go look at @DaveKerpen and at @LikeableMedia look at both. See what he does. There’s a great balance between family and the real person and business. I like him.